Yup – sure enough – I had one of those “oh crap” moments during the holidays. I smugly thought I had planned and prepared like a seasoned war veteran for Holiday Season 2010. WRONG! SMACK! I didn’t make any wine gift bags (or spirit bags as some of my good friends are partial to other beverages of the alcoholic nature.) And what’s more festive than a rocked out presentation of Holiday Booze? These are great for presenting a nice bottle of wine (Pinot Noir please) or Vodka or Scotch or heck – why not one of those fancy glass containers of Eggnog! I had three really nice bottles of wine to give to a friend of mine (one from me, one from Thing 1 and one from Thing 2). And I THOUGHT I had some decorative wine bags to present them in (wrong) so I found myself scrambling last minute to find my good wine bag pattern. 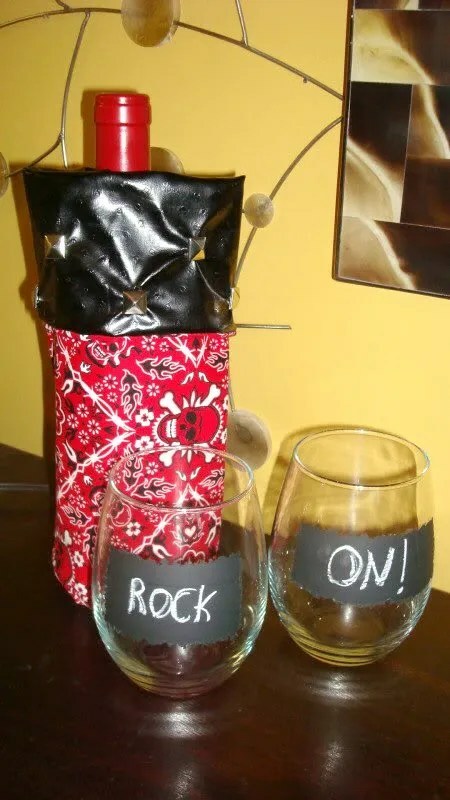 Yes – “good” wine bag pattern. In my haste – I couldn’t find the one I wanted. Surely there MUST be a good one out there on the internet? Nothing really came up to my liking, so after the holidays and without the last minute panic I found my “good” pattern. I’m posting it here and I’m encouraging all of you to start making these ahead of time. Since these are more “rock” fashioned than “holiday” fashioned, you can use them for birthdays, weddings, or any celebration to your favorite rocker or rocker fan! So put on your best metal itunes playlist and let’s get rockin! 21″ x 15″ piece of contrasting fabric (Fabric B – Lining) and Lining Bottom to use on the inside of the bottle. This is going to be the part you see folded over the top edge and blinged out with some METAL!!! Crank up your metal, rock or alternative music. If you haven’t already done so already, take a swig of vodka to get in the right state of mind for this project. Start by cutting your fabric A and B into 14 7/8″ x 14 7/8″ squares. One is for the cover and one for the lining. Chalk your 5/8″ sewing line on one edge and the top and bottom. Along the bottom sewing line, mark a perpendicular line every 13/16″. Do it to the drum beat! Using the Bottom Cut Line template – cut circles from your A and B fabrics. 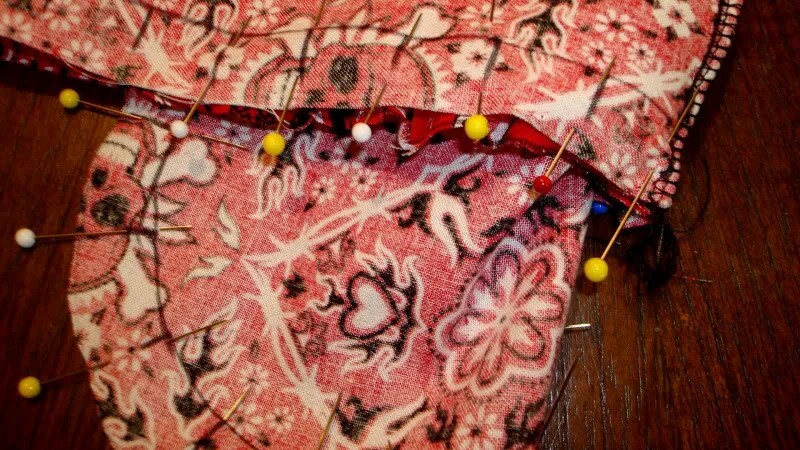 Transfer your pin lines to the back or wrong side of the fabric. Use your Bottom Sewing Mark template to trace a sewing line on the backside or wrong side of the fabric pieces – you’ll get better results when you sit down to sew – especially if you’ve decided to go with the Vodka option. Now – take another shot of vodka because this part can be irksome. But I’ve developed a little trick to make it so much easier! Insert pins into the pin lines you drew in Step 2 and Step 3. I like to watch a little TV while I do this. If someone’s sitting next to you on the couch, resist the urge to poke them, even if they are making catty comments about the amount of vodka you’re drinking. OKAY! Hard part over. Take a shot of vodka to celebrate! Oh Yeah! Fold each square piece in half – right sides together (that’s the pretty side of the fabric for you non sewers) lining up the edges. On Fabric A – the Cover piece – Sew up the side along your sew lines. On Fabric B – the Lining Piece – Sew up the side along your sew lines BUT leave a 1 ” gap right smack dab in the middle. VERY necessary. Don’t forget. It’s pinning time again! Grab your project, remote and Vodka and have a seat at the couch. Take another shot of vodka as the person next to you is giving you the evil eye. Using Fabric A pieces – ensure that the Right Sides are together – and line up the pins on the circle to the pins on the square pieces. One at a time, you will remove one pin and re-insert the other pin into both pieces. Rinse and repeat. This tedious little step just ensured that the fabric is evenly distributed and the sew lines are perfect. If the person on the couch is still giving you the evil eye go ahead and poke them now as they clearly had it coming. Now just sew along your sew line, removing pins as you go. Repeat with the Fabric B pieces for the lining. Then go ahead and sew along those sewing lines, removing the pins as you go. Now at this point, we’ve drank our vodka, we’ve been inspired by raging metal music in the back ground – lets make this puppy bark! Just so you know, REAL rockers don’t bedazzle. When I was studding jackets and vests and jeans the “bedazzler” was a description for some hokey Las Vegas show magician. REAL rockers use pliers – needle nose to be exact. Take a look at this little baby- I’ve had this for over 20 years – it’s survived many different rocker boyfriends, a bad marriage and someday I will pass these down to my children. Go ahead – covet. Here’s what you do – insert the stud by pushing the prongs through the fabric. Next – ensuring that the prong is through the fabric, fold the fabric near the prong corner and squeeze the prong back to the middle of the stud using your trusty needle nose pliers. Move to the next prong. Once completed – hold your two middle fingers by your thumb in the universal symbol of rock! Now you need to assemble the pieces together. Take another shot of vodka to celebrate because you’re close – oh so very close to being done! The liner (Fabric B) should already be inside out. Pin the cover and lining top edges together and sew. Through the gap that you left in the side seam of the liner, gently coax the cover out. (you DID leave the gap didn’t you?) Sew just along the edge to close up that gap before you tuck the lining inside the bag.